Here’s a video created by WeEatAfrican on you tube on how to cook Egusi Okra soup. 1) Cook the beef, ox tail and cow skin together in some oil, over medium high heat in a large pot. Seasoned with salt, pepper and maggi cube. 2) Reduce heat to medium and add stockfish and dry fish. Mix add the crayfish. Stir well. 3) Cover and let the ingridients cook for about 5 minutes. Check for seasoning and adjust if needed. 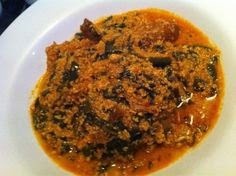 4) Add the palm oil, mix well and then add the egusi. Mix well. Cover the pot and let the ingredients cook for about 10 minutes. 5) Mix together the mixed greens and pumpkin and add the mixture to the soup. Mix well and let the soup cook for about 2 minutes. 6) Once the soup is done, taste for seasoning and adjust if needed. This is a thick soup so there will be almost no liquid once it is done.